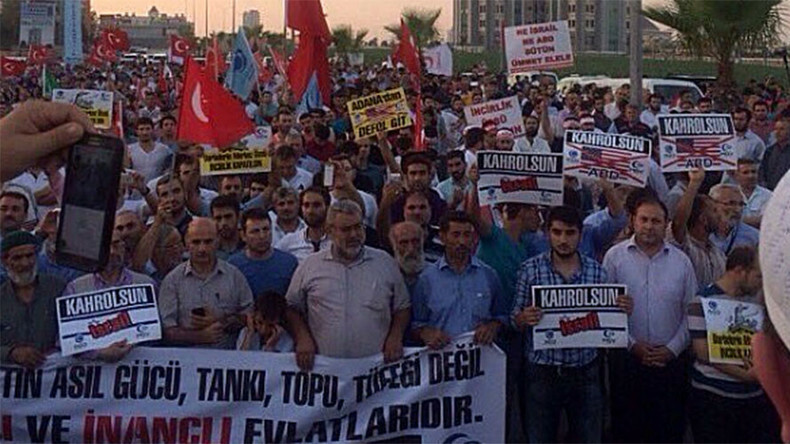 A crowd has been protesting near the Incirlik military base in Adana, Turkey. The facility houses US and NATO forces. The demonstrators are calling for the closure of the base, where arrests and searches were made in connection with the failed coup. Regional television has been broadcasting the rally. Reports on social media suggest up to 1,000 people have gathered to support the demonstration. Protesters have been shouting anti-American and anti-Israel slogans, according to an RT stringer. Police have been deployed to block the entrance to the base, according to reports. American officials have informed US citizens that the consulate in the city will be closed at the time of the protest. US citizens in Turkey: Demonstration expected from Merkez Park to Incirlik Air Force Base 6pm July 28. Consulate in Adana will close at 4pm. The base has made the headlines recently in connection with the failed coup in Turkey, and searches have been conducted at the facility by Turkish prosecutors and police. The air base commander, General Bekir Ercan Van, has been detained at Incirlik by the Turkish authorities along with over a dozen lower ranking officers, all accused of complicity in the attempted coup. Incirlik is used by NATO and stores US tactical nuclear weapons. Washington has been using the base in its campaign against Islamic State (IS, formerly ISIS/ISIL) in neighboring Syria and Iraq.